What is the Importance of Financial Management in Your Business? When Will America Have Its "Charlie Moment"
Last night on Revolution, a new show on NBC that depicts the remnants of the USA 15 years after electricity suddenly stopped working, Charlie (the hot blondie blue chick) chastised two compatriots because they were so intent on stealing a sniper rifle that they had not even thought about what the sniper was guarding ... thirty enslaved people. The show is fictional, of course, but hardly irrelevant: people today, in the good ole USA, are working against their will, usually at mere subsistence levels. When will some Charlie out there awaken the nation to the slaves amongst us? Well, President Obama may be trying to do so, TODAY, 25 Sept. 2012, in his speech from the Clinton Global Initiative at Noon EDT. We shall see. This week we closed on the sale of what had been our home for 19 years. Going through a packing frenzy of moving life-long belongings and wanting to pass on a sparkling, clean adobe; the moment caught me completely off-guard. I am not an emotional person, but upon the final signature at the closing, I burst into tears and hugged the new owners of our home where we had raised our family. I was passing a part of us on to these newly-met out-of-towners. Yes, I saw Stephen Colbert's interview of Yvette Clarke (D-NY) in which Ms. Clarke professed to believe that slavery existed in New York City in 1898. That is eighteen ninety eight, 30+ years after the Civil War, the Emancipation Proclamation, and the 13th amendment of the U.S. Constitution ended formal slavery. Clearly, Clarke was confused about the chronology, even claiming that the Dutch were the culprits. I gave this presentation before the CFA Society of Buffalo on 9/7/12. As classes have started and I’m back to teaching personal finance, I have a challenge for all the students taking this class and using “Personal Finance; Building Your Future” by Walker & Walker. 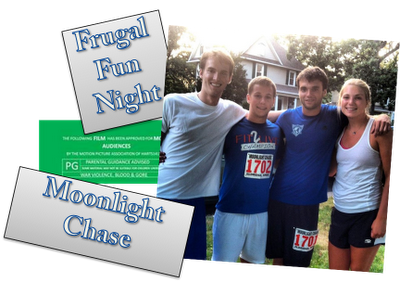 I want to know who can come up with the best frugal fun night. Add your suggestions and ideas by adding it as a comment to this blog. Keep it clean (PG rating), include an estimated cost and how this Frugal Fun Night reflects your values – the values that you worked on in Chapter 1. Remember, being frugal is not being cheap, but it is the wise spending of money in accordance with your values. I look forward to reading your responses and getting ideas of how I can spend a Frugal Fun Night!